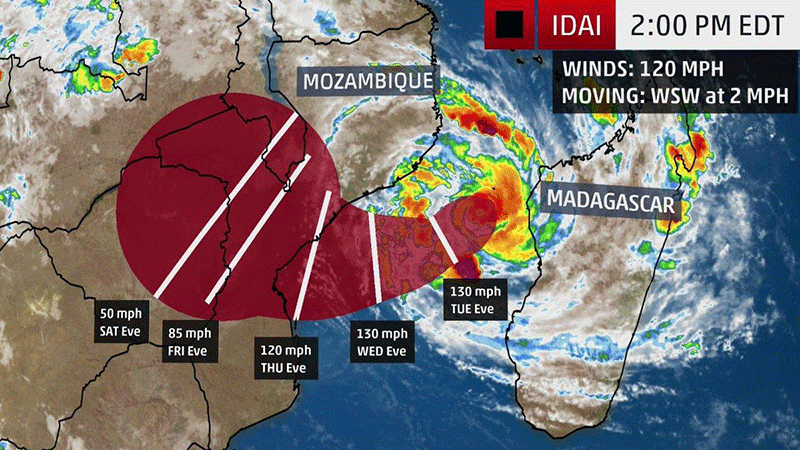 A 15-member team, including KwaZulu-Natal rescuers, is en route to Mozambique to assist with potential relief efforts, as Cyclone Idai barrels towards the country's coastline. Forecasters expect the cyclone to make landfall in the coming days. Two provinces there have already been affected by flooding in the past week, with authorities confirming more than 60 fatalities. Emergency workers from the Lenmed Private Hospital Group, Rescue SA - and the KZN-based IPSS Medical Rescue and Rescue Care will arrive in Maputo today. IPSS spokesperson, Paul Herbst explains the equipment they'll have at their disposal. "We've taken majority of the aquatic kit. We've taken boats, jet skis, all terrain vehicles, four-wheelers, and motorbikes. Together with Rescue South Africa, this is their first cross-border mission. They've got majority of the larger equipment in order for us to do diving operations obviously with jaws of life to cut under water and obviously above." He says the team is receiving hourly weather alerts and on-the-ground updates to help identify the areas that need their help the most.